Life just seems better at the beach! As you step onto the sand, it's like the sea breeze and rolling waves wash all your worries away. A day on the sand means something different to us all, so it's all about finding your perfect beach. That might mean a quiet spot where you can get comfortable for hours on end. Or maybe you need plenty of entertainment, sitting still just isn't for you! For most of us, the perfect beach day sits nicely in the middle. 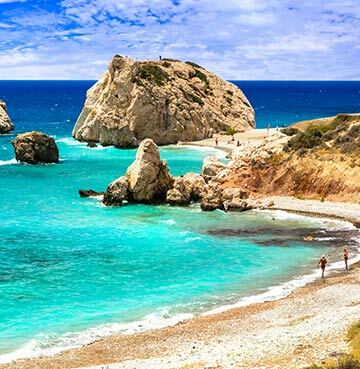 With our guide to the best beaches in Cyprus, you can find your sandy paradise on this amazing island. Its official title might not ring any bells, but 'Aprodite's Rock' is known all over the globe. 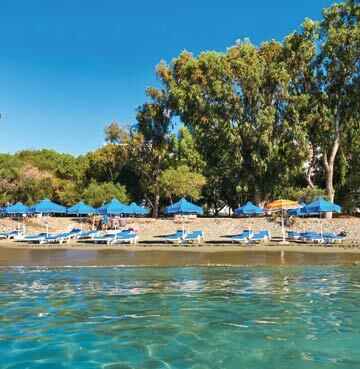 Beach lovers flock here in their droves, searching for a piece of Cyprus' mythological pie! And when they lock eyes on this stunning sea stack, it tastes even sweeter than they could have ever imagined. This is supposedly where the Goddess of Love emerged from the sea, beginning life amid a crashing wave and foaming sea. And legend has it that if you swim round the rock three times, you'll find true love! Although if you're already spoken for, just kick back on the pebbles and enjoy the view. If setting suns pull at your heartstrings, be sure to head here in the early evening. There's something mesmerising about the sun disappearing into the sea, illuminating Aphrodite's Rock on its way down. 'Something for everyone' might sound like a bit of a beach cliché, but this 500m stretch truly delivers! Blue Flag status, soft golden sand and tempting waters – Coral Bay is one of those classic beaches that you'll never tire of. If you're in need of some relaxing time in the sun, hire a bed and let a wave of tranquillity wash over you. If any more than five minutes of sitting still sounds like a beach nightmare, take on a watersport and let a literal wave crash and splash over you. Perhaps you're heading to Cyprus for a family adventure? You'll have peace of mind while your little ones frolic here. Calm and shallow waters make for safe swimming conditions, so you can all splash safely on your day at Coral Bay. 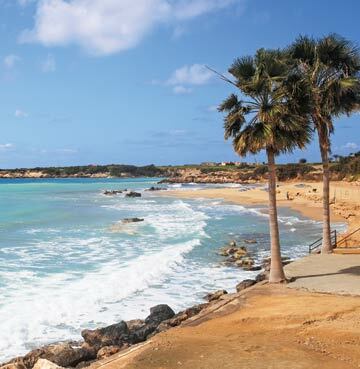 If you're looking for all round beach fun, this is one of the best beaches in Cyprus. Taking a pinch of everything that makes the Cypriot landscape so beautiful, Dasoudi is like a mini paradise for nature lovers. This sandy beach is gloriously golden and you can see right to the bottom of the seabed too! All against a backdrop of rugged mountains, towering in the distance. Could it get any better? Actually it could! A forest runs alongside the sand, home to eucalyptus trees and a wonderful path in the shade. Stretch your legs and take in all the marvellous sights along this kilometre of sand. With just the right amount of things to do, Dasoudi offers peace and play all wrapped into one. Watersports, beach volleyball and a play area are great for family fun and those with boundless energy. But if you're seeking rest and relaxation, there's plenty of peaceful places to unwind. Lay back and listen to the sound of the sea, feel the sun on your skin and let Cyprus recharge your batteries. A refreshing sight greets you as you arrive on Lara Beach – there's not a sunbed, beach bar or (probably) another soul in sight. But before you start rubbing your eyes in disbelief, this is not a mirage! It's your back to beach basics, as Mother Nature intended, day on the sand. As a protected breeding ground for turtles, Lara Bay sits just out of touch of those long reaching fingers of tourism. Green and loggerhead turtles arrive on these shores between May and August, laying their eggs on the curving golden arc. So you might even spot some as you kick back on the sand! Wardens patrol the sand, protecting eggs with small cages – so keep your eyes peeled for these too. Don't forget to pack a picnic – you won't find a restaurant here! 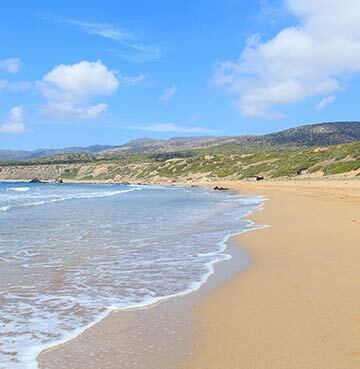 The slither of sand here is small, tucked away behind the rocks and often lapped by the waves – so how exactly has it made it onto the list of Cyprus' best beaches!? It's best to let the electric blue waters do the talking. The most majestic shades of turquoise and azure, just waiting for you to dip your toes in. And when you take the plunge, you'll find that the waters feel just as incredible as they look. In this sheltered bay, the sea is warmer than most beaches on the island – caressing your skin as you swim around. Why not pack your snorkel and spend as long as you like floating along the surface? Most visitors to the Blue Lagoon choose to arrive by boat, letting them dive right into the irresistible blue below! You won't want to hang around once you see this sapphire masterpiece up close and personal. Your Cyprus beach holiday is waiting to begin! 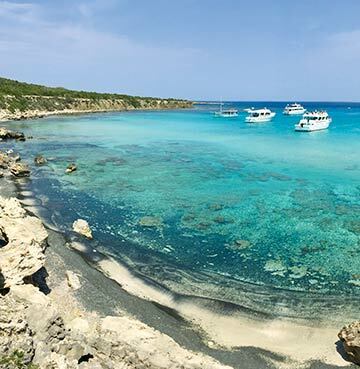 But there's plenty more things to do in Cyprus, it's time to find some additions to your holiday itinerary.